Engineers at Palm Computing Inc. have made a lady out of the now-venerable Palm III handheld computer with today's introduction of the Palm IIIc. That's c as in color. You can get a Palm IIIc with 8M of memory and a 256-color display for $449, compared with $149 for the basic Palm III. With color, Palm devices can compete with handhelds from Hewlett-Packard Co. and Compaq Computer Corp. that run Microsoft Windows CE. I say 'can' because there are few software applications for Palm OS that take advantage of color. But Palm Computing needs a color device to stay in the handheld running now that it is separating from parent 3Com Corp. of Santa Clara, Calif.
One available application, called Album to Go, stores .jpg files in full-screen size on the IIIc, either downloaded from a PC or captured by a digital camera. The nifty little $149 PalmPix camera from Eastman Kodak Co., which plugs into the IIIc, is scheduled for shipment next month. It will take .jpg images that can be uploaded from the Palm. But because the screen is so small, the images stored on the Palm are only about 40K each. I'm a confirmed Palm user. I like the efficiency of the Palm OS and of the Palm apps I have tried. But no one would argue that Palm displays are easy to read under all conditions. In an auditorium with gas vapor lighting, for instance, I have to squint and hold a monochrome Palm at odd angles. In low light, it is nearly impossible to read. Using Palm Desktop software, supplied with the device, you can create several databases, each with its own assigned device, running on one PC. 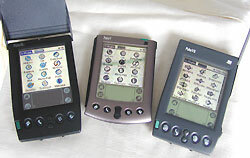 The software recognizes the unique identity of each Palm device. But it would be inconvenient to have to switch serial port cradles for each device. Palm Computing should come up with a universal synching cradle for all its machines. The Palm IIIc is available from federal resellers including CompUSA Inc. of Dallas and the government division of Computer Discount Warehouse Inc. of Vernon Hills, Ill.